James Richards’s daybook, a 325-year-old ledger that had been passed down through generations of a New England family, was stored in a pillowcase in a dusty attic when it was handed to the historian James E. Wadsworth. This record of economic life reinforces and challenges our understanding of colonial America. 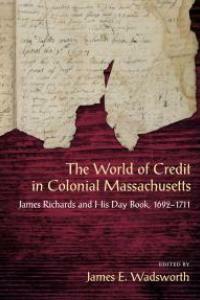 For nearly twenty years, James Richards, a prosperous and typical colonial farmer, tracked nearly five thousand transactions, involving more than six hundred individuals, stretching from Charlestown to Barnstable. Richards and his neighbors were bound together in a heterogonous economy, reliant on networks of credit, barter, and sometimes cash. Richards practiced mixed husbandry farming, shipped goods by cart and by sloop, and produced and sold malt, salt, wool, and timber. The daybook also reveals significant social details about Richards and his household, including his diverse trading partners, his extensive family connections, his claim over an Indian slave girl, and his expenditures on behalf of a well-dressed female servant. About the speaker: James E. Wadsworth is a professor of history at Stonehill College. His first book entitled Agents of Orthodoxy: Honor, Status and the Inquisition in Colonial Pernambuco Brazil (2007) is a collective biography of the men who ran the Inquisition between 1613 and 1821 in the Captaincy General of Pernambuco. His second book, In Defence of the Faith: Joaquim Marques de Araújo A Comissário in the Age of Inquisitional Decline(2013), shrinks the historical scale by engaging in an experiential microhistory of the career of one formidable comissário who worked between 1770 and 1820. He is also the author of Columbus and His First Voyage: A History in Documents (2016); The World of Credit in Colonial Massachusetts: James Richards and his Day Book, 1692-1711 (2017), and the forthcoming Global Piracy: A Documentary History of Seaborne Banditry (2019).